As a science teacher I am a part of my vibrant school professional community that is based on community of learners, their families, teachers, support teams and school leadership which are all involved into establishing learning process on a large scale. Teaching science connects me closely to other science teachers within my school, as well as with science teachers in other schools in Auckland region. This collaborative network is built mainly through Auckland Science Teacher Association via PD sessions, lectures and newsletter regarding resources, scientific research news and pedagogy. Recently, this local network was enriched by establishing closer connections with science teacher Danielle Myburgh and visit to Hobsonville Point Secondary School. As Westlake Girls High School is implementing digital and collaborative learning in last two years, it was very appropriate to establish connection with the school that is completely immersed into the 21st century teaching style. It has been very encouraging to see blended learning in action, exchange ideas and share experiences that can be used for my own teaching practice. This type of professional connections are very precious and they truly contribute to personal development, self-reflection and action research within own teaching practice. It really creates completely new perspective and helps to clarify ideas regarding application of certain methodologies and tools in the learning process. The other very important community is established with my Postgraduate course at Mind Lab where I have an opportunity to share the journey of ‘rediscovering the teaching practice’ with a group of similarly inclined educators. Connections established during the course are now extended via our closed Google group where we share and discuss issues regarding our course, as well as issues of implementing digital and collaborative learning into our classrooms, application of leadership skills, educational action research and self-reflective practice. Being part of a fairly small group that has a common interest is important as we create the support network in achieving common goals, while at the same time we share and expand our own knowledge and increase our metacognition. A mind map of my professional connections. Considering that we live in a very connected world, I had to include the internet itself as a part of my professional connections. This global connectivity allows establishing of completely new types of communities of which some are physical entities and some are completely virtual. Having the huge amount of information, research and resources available, internet requires establishing priorities in what is to be stored, shared or discarded. Creating and following certain communities via blogs, forums or (in my case) Flipboard magazines is a completely digital way of establishing professional connections in todays world. Social media form a great platform for creating global educational virtual communities. Twitter is my personal favourite as it shares a large amount of educational news and for enabling participation in professional discussions like #edchats, with sometimes challenging question regarding our teaching profession and practice. 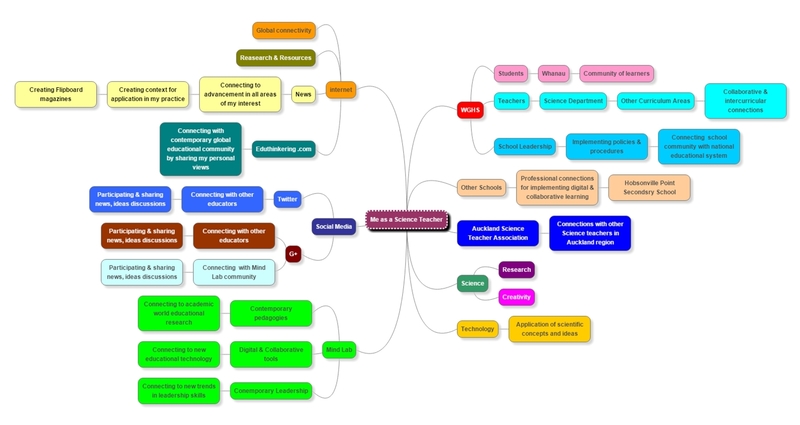 By looking at my connections mind map, it is obvious that my personal focus lays within scientific field and scientific education. However, I am very aware that in this time of globalization, we are moving toward developing new more integrated skills in students such as problem solving which requires more project based learning and teaching. To develop such multilayered skills, intercurricular approach is needed and that means also interdisciplinary collaboration within school communities with teachers from other subject areas. The consequence of such more holistic approach where topics are analyzed through the lenses of different subject areas at the same time would contribute to more rounded knowledge, where students can learn to interconnect various information and build true links of understanding and deeper knowledge. The other consequence of such approach would be probably the need to change the whole subject and class time organization within schools, which might be of a logistic challenge in a large size schools.